People are led on a tour on the campus of Harvard University in Cambridge, Mass. Editor's note: This story is one in a series on education issues featured at the 2013 Education Nation summit in New York City on Oct. 6-8. To learn more, please visit EducationNation.com. The leafy campuses of the country's most selective colleges and universities have long drawn students who are intelligent – and wealthy. But the pressure is on for these elite schools to attract more high-performing students of limited means. Many top tier institutions have hefty endowments that enable them to offer financial aid packages large enough to bring the cost of attendance in line with—or even lower than—many public universities. Despite that, a study earlier this year showed that elite public and private colleges have largely failed to attract low-income students. 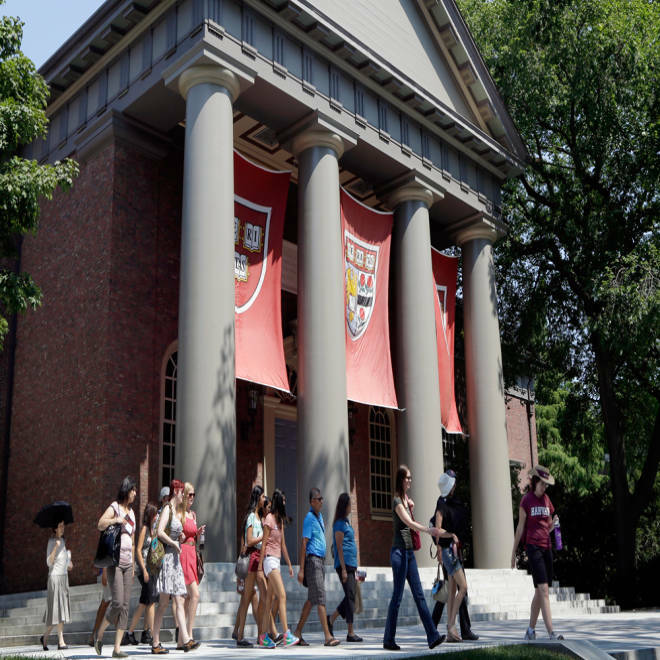 Only 34 percent of high-achieving high school seniors in the bottom fourth of income distribution attended one of the country’s 238 most selective colleges, according to the analysis, conducted by education researchers Caroline M. Hoxby of Stanford and Christopher Avery of Harvard. The challenge now is for top colleges and universities to find ways to make all high-performing students aware of those opportunities. "The bottom line is that students have more options," said Jennifer Desjarlais, dean of admissions at Wellesley College. Wellesley took a step in that direction in September when it launched My inTuition, a simple financial aid calculator on Wellesley's website that lets students and families quickly see an estimate of the aid package they might receive. Because the calculator is so simple, it may not generate the best results if students' financial situations are complex. But as a preliminary tool it is significantly easier to use than the federal financial aid calculator. Families visiting Wellesley over the summer were invited to try out My inTuition, and Desjarlais says the reaction was extremely positive. "More modest income people said, 'this is the first time I have a real idea of the cost to me," she said. One student said she could actually use the calculator herself—a significant benefit if she or others are the first in their families to apply to college. The efforts to expand outreach aren't limited to the campuses themselves. A number of new apps are trying to demystify the college application process. Several nonprofits are also working on placing high performing students of limited means in selective colleges. For example, QuestBridge, offers a college match program aimed at placing top students at one of its 35 partner schools. Students who are accepted into the QuestBridge college matching programs receive full scholarships or generous aid packages if they are accepted at one of their chosen schools. Edith Cricien used QuestBridge to land a spot at Amherst College. Cricien, a senior from Miami who is majoring in psychology, wanted to aim high after high school, but said her parents, an airport mechanic and an adult basic education teacher, were "not really able to help me—not because they didn't want to, but because they didn't know the system." Her high school, with 650 students in a grade, had little more to offer. Jeremiah Quinlan, admissions director at Yale, which is also reaching out to high achievers with limited resources, says that kind of environment affects high-achieving students desire to aim for top colleges. "Students make most college decisions on peers and community influence." Cricien was lucky, though, because she did have teachers who encouraged her to aim high. When she heard about QuestBridge, she applied to a high school program they had, and was assigned a telementor who happened to be from Amherst. "I never knew about liberal arts colleges in high school," she said. "Once I got paired with a telementor at Amherst, I learned about Amherst and liberal arts colleges generally." Cricien wound up applying to eight colleges, and was accepted at her two top choices. Now she works part time as an intern in the admissions office, helping with efforts to recruit low income or minority students. "Amherst has been very generous," she said. "Basically, Amherst has paid for pretty much all of my education." Gail Holt, Amherst's dean of financial aid, says the college is focused on increasing access for low-income students, and does not consider financial need for either American or international applicants. More than 20 percent of the students at Amherst receive Pell grants, need-based federal aid. "To cluster the sectors together and say all private colleges are going to be more expensive and all public colleges are going to be cheaper does the public a very great disservice." A Stanford University student on campus. Stanford has also long been focused on increasing access. "We've been there, done that, and continue to do that," said Richard Shaw, dean of admission. A case in point: The university was an early partner with a professor there, Caroline Hoxby, who has been researching ways to expand college access. In a study she published recently with Sarah Turner of the University of Virginia, a group of students with high SAT scores and low family income were sent packets of information on top schools and financial aid options, and waivers for application fees. Some 54 percent of those students wound up being admitted to top schools, compared with 30 percent for high-achieving low-income students who did not get the packets. The College Board, administrator of the SAT, was so impressed with the results that it now plans to send similar packets to future high achievers. As for plans for further outreach, Shaw and others are stepping carefully into the world of social media. 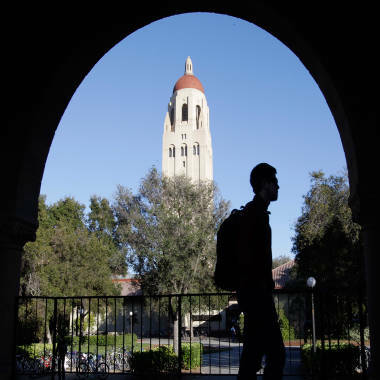 "We are using social media to talk about Stanford and allow students to engage with Stanford—but we are not hard selling them with social media, nor do we interfere with their personal social media," he said. "We don't want to be in their Facebook." The push at private colleges comes as public institutions are contending with cuts in state and federal aid. In a message about a planned tuition increase for the school year just ended, University of Washington says state funding has declined by 50 percent since 2009. Shortfalls like that one are leading many public colleges and universities to raise tuition and curb financial aid to needy students. The bottom line: Students should think about a much wider range of colleges and universities. The possibilities may be broader than they appear. "We are able to provide social mobility through education," said Janet Rapelye, dean of admissions at Princeton, where low income students make up almost 20 percent of the freshman class. "This is an important value. It's what higher education was meant to do in this country."